This user guide contains a description of the different tasks that can be performed in the Business API Ecosystem using its web interface. 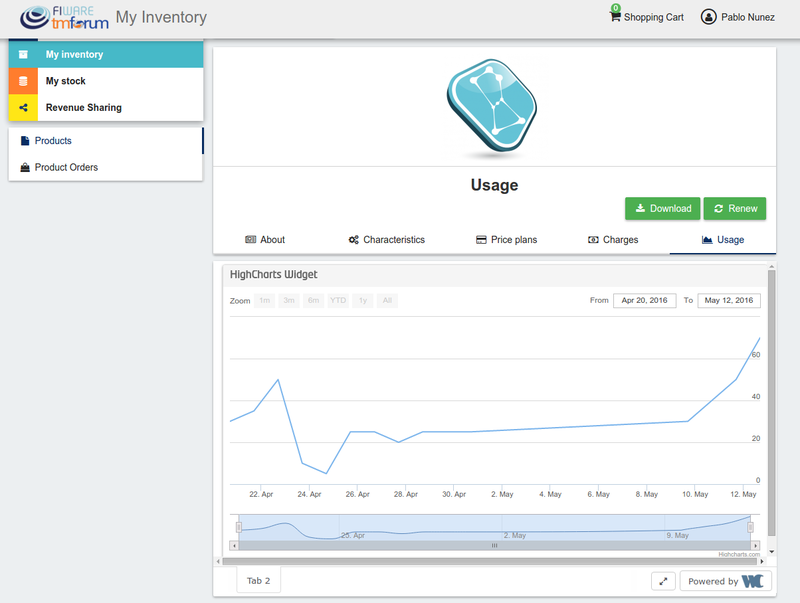 This section is organized so the actions related to a particular user role are grouped together. The Business API Ecosystem supports organizations as defined by the FIWARE IdM. These organizations can use the system as if they were users, being possible to create organizations catalogs and offerings or acquire them. To use the platform on behalf an organization the user belongs, it is needed to change the platform context. To do that, it is used the Switch Session option of the user menu. All the users of the system can configure their profile, so they can configure their personal information as well as their billing addresses and contact mediums. 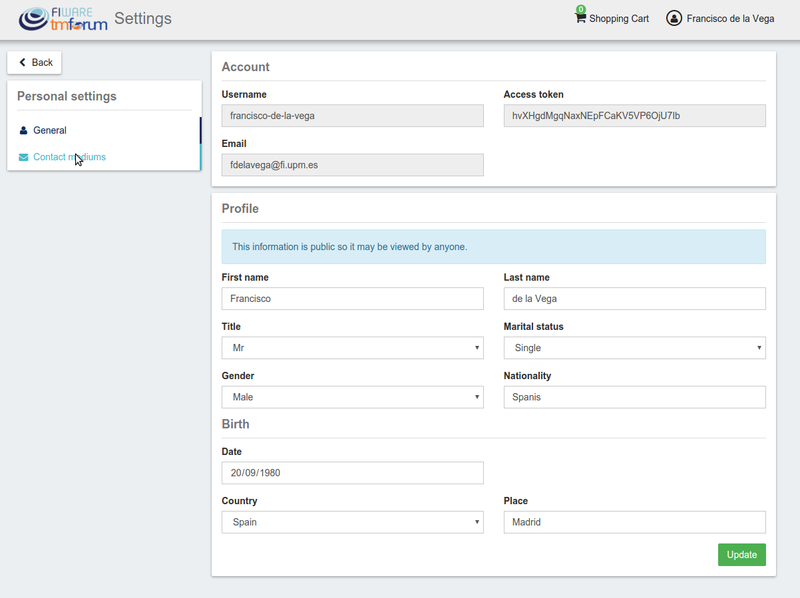 To configure the user profile, the first step is opening the user Settings located in the user menu. 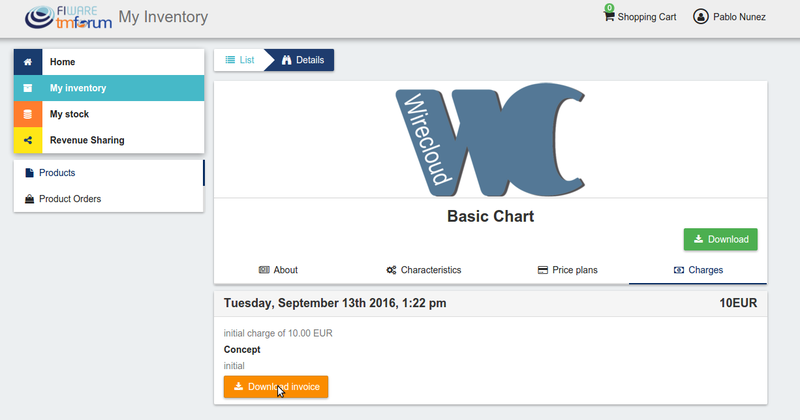 In the displayed view, it can be seen that some information related to the account is already included (Username, Email, Access token). This information is the one provided by the IdM after the login process. The profile to be updated depends on whether the user is acting on behalf an organization or himself. 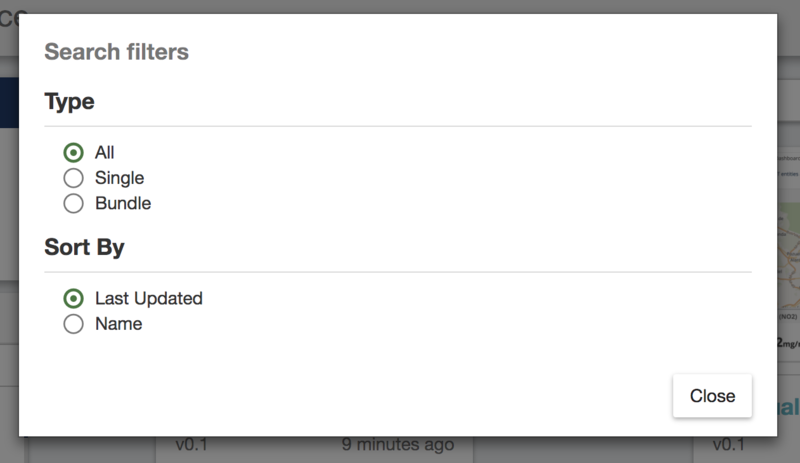 In both cases, to update the profile, fill in the required information and click on Update. For users, personal information is provided. For organizations, general organization info is provided. Once you have created your profile, you can include contact mediums by going to the Contact mediums section. In the Contact Medium section, there are two different tabs. 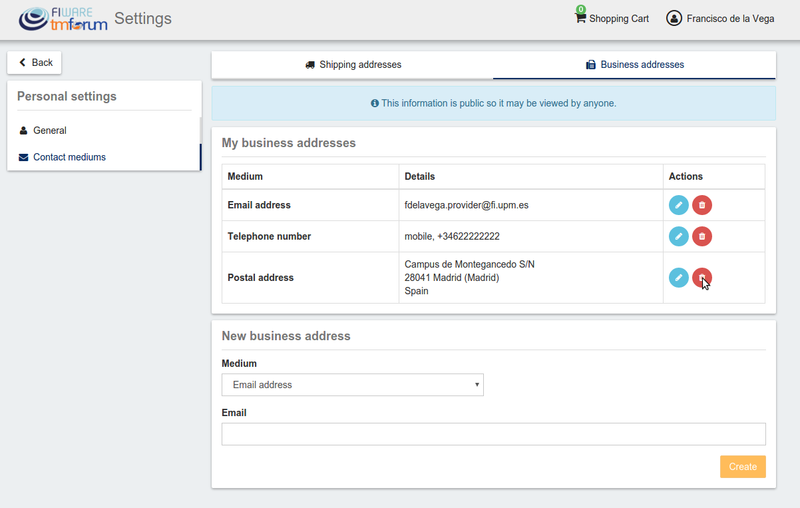 On the one hand, the Shipping addresses tab, where you can register the shipping addresses you will be able to use when creating orders and purchasing products. 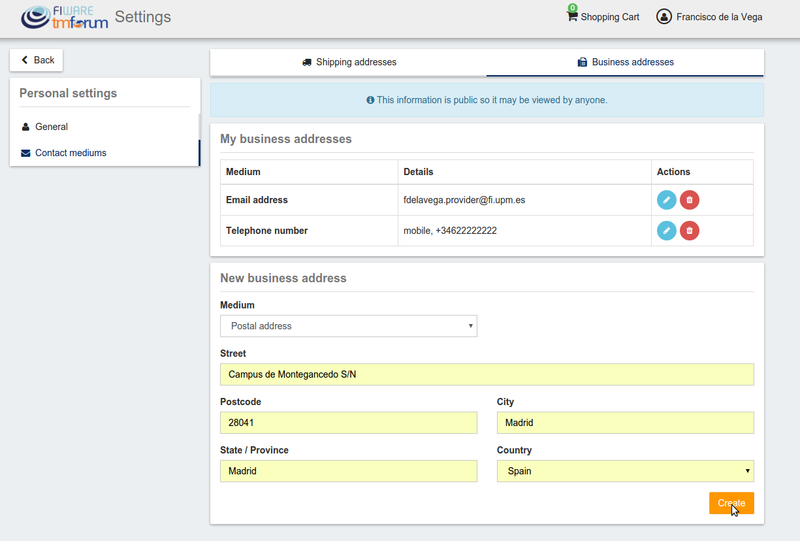 Once created, you can edit the address by clicking on the Edit button of the specific address, and changing the wanted fields. 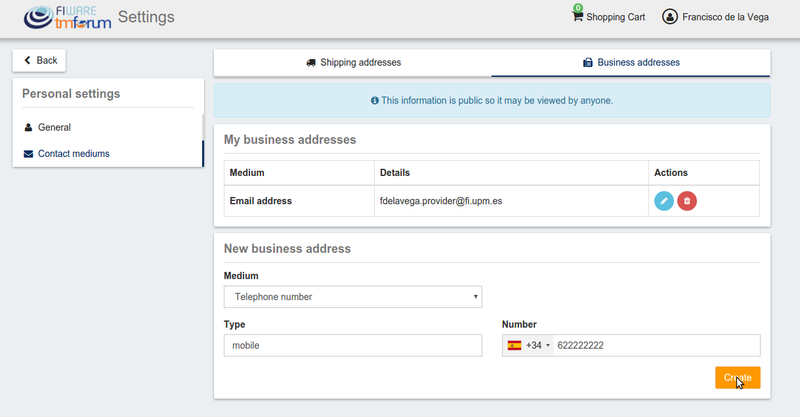 On the other hand, if you have the Seller role you can create Business Addresses, which can be used by your customers in order to allow them to contact you. 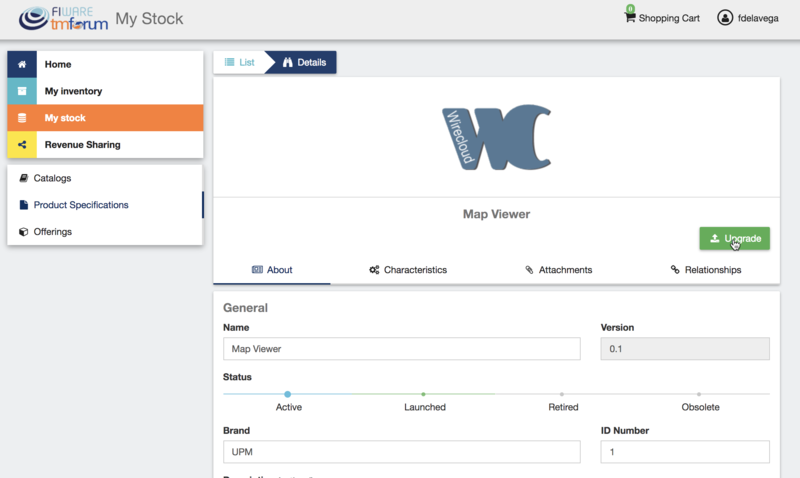 If the user of the Business API Ecosystem is an admin, he will be able to access the Administration section of the web portal. This section is located in the user menu. 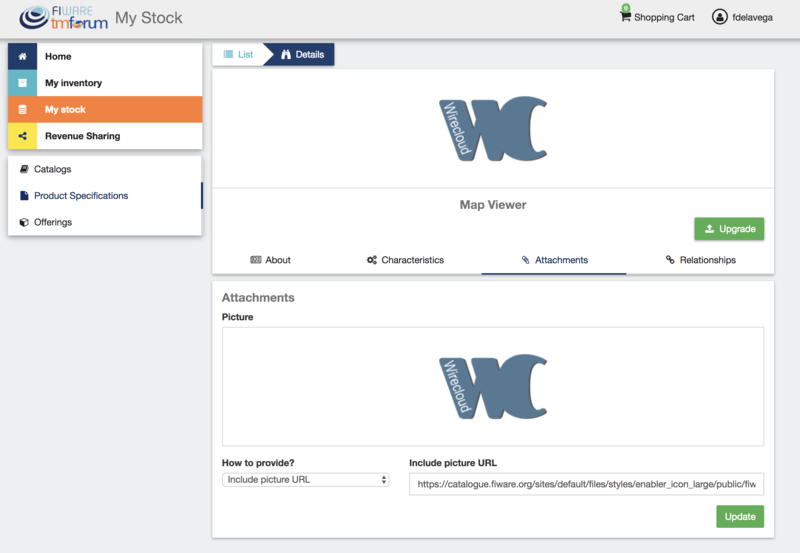 Admin users are authorized to create the system categories that can be used by Sellers to categorize their catalogs, products, and offerings. 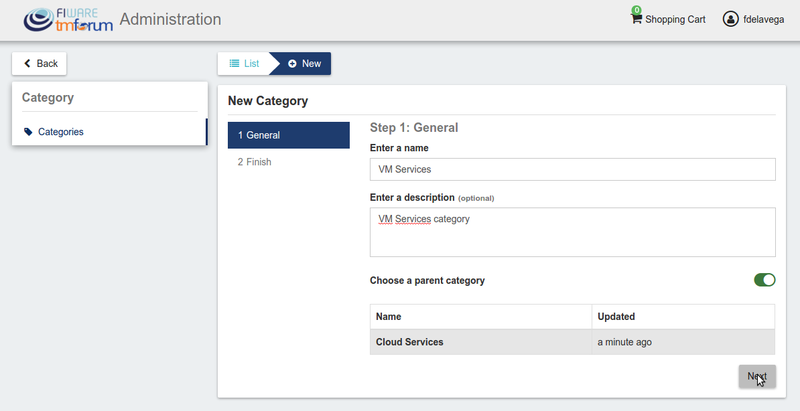 Categories in the Business API Ecosystem can be nested, so you can choose a parent category if you want while creating. Existing categories can be updated. To edit a category click on the category name. Then edit the corresponding fields and click on Update. 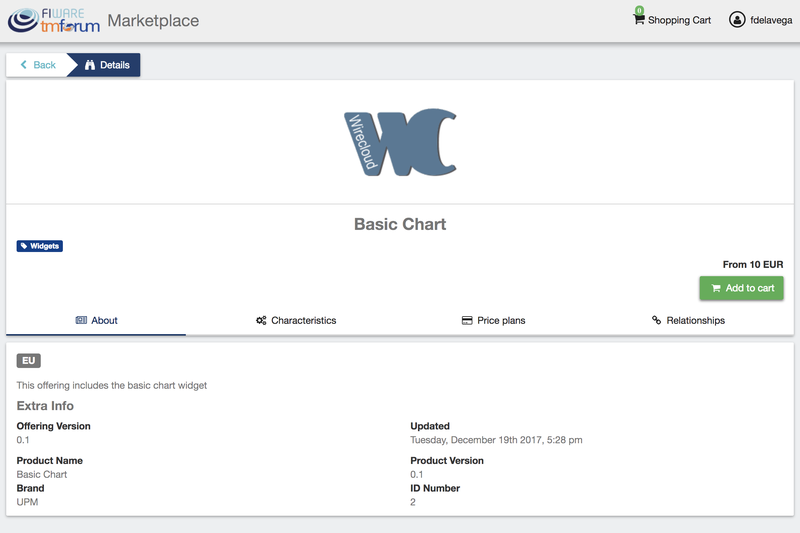 If the user of the Business API Ecosystem has the Seller role, he will be able to monetize his products by creating, catalogs, product specifications and product offerings. All these objects are managed accessing My Stock section. 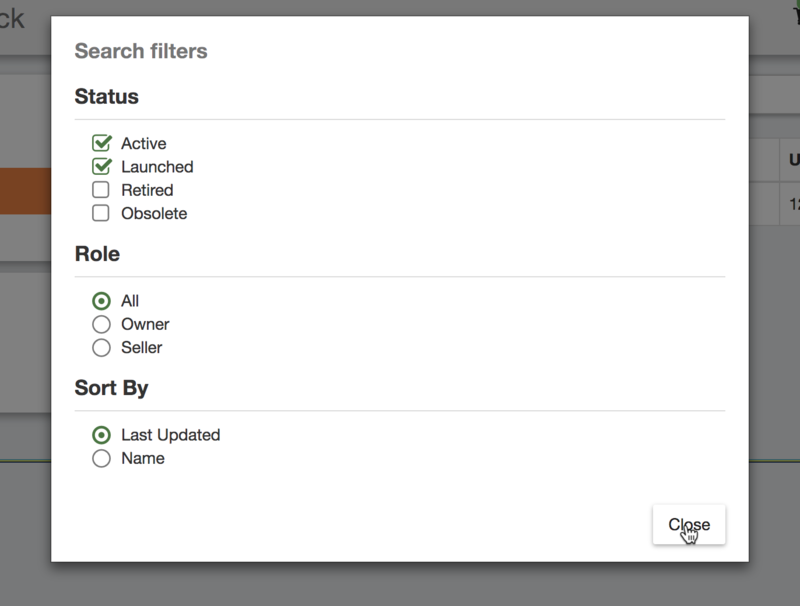 The Catalogs section is the one that is open by default when the seller accesses My Stock section. This section contains the catalogs the seller has created. Additionally, it has been defined several mechanisms for searching and filtering the list of catalogs displayed. On the one hand, it is possible to search catalogs by keyword using the search input provided in the menu bar. 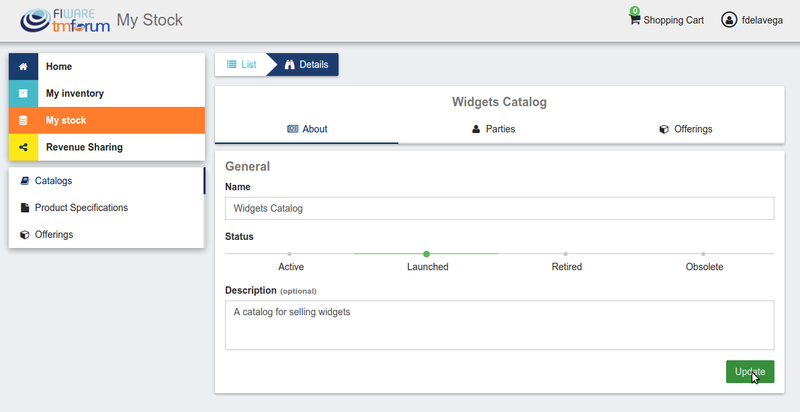 On the other hand, it is possible to specify how catalog list should be sorted or filter the shown catalogs by status and the role you are playing. 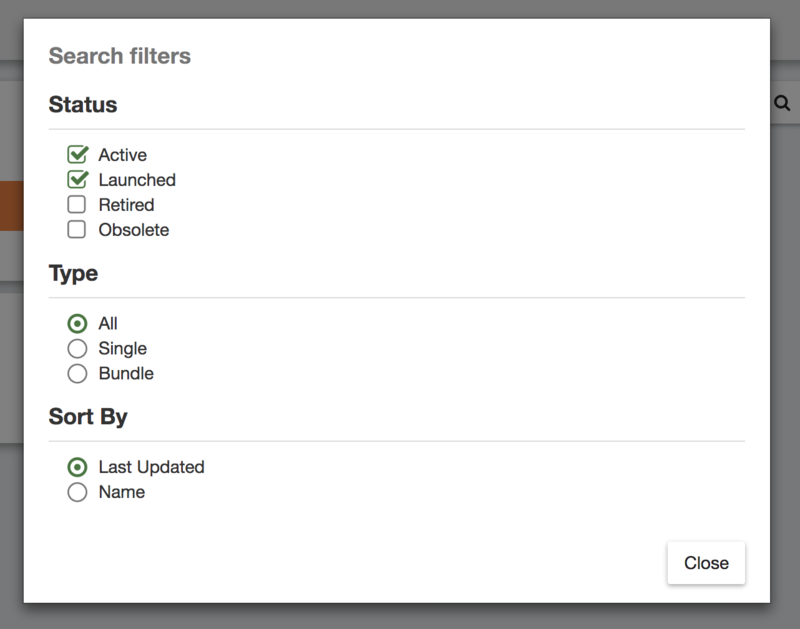 To do that, click on Filters, choose the required parameters, and click on Close. 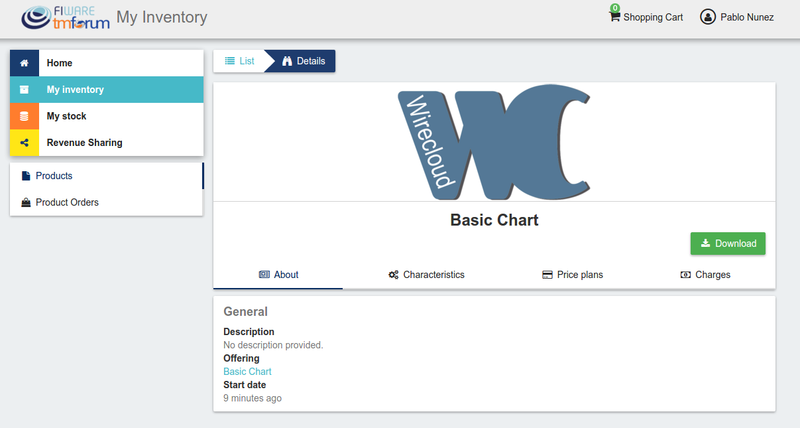 To create a new catalog click on the New button. 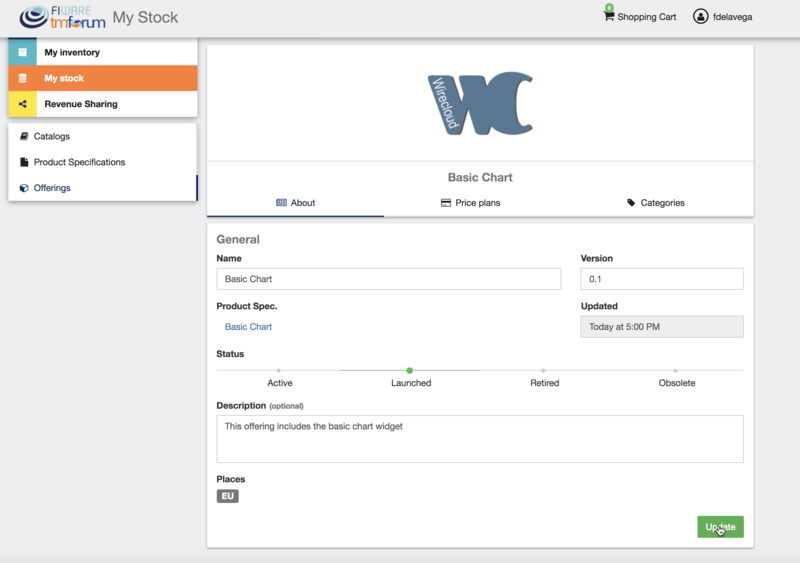 Sellers can also update their catalogs. To do that, click on the name of the catalog to open the update view. 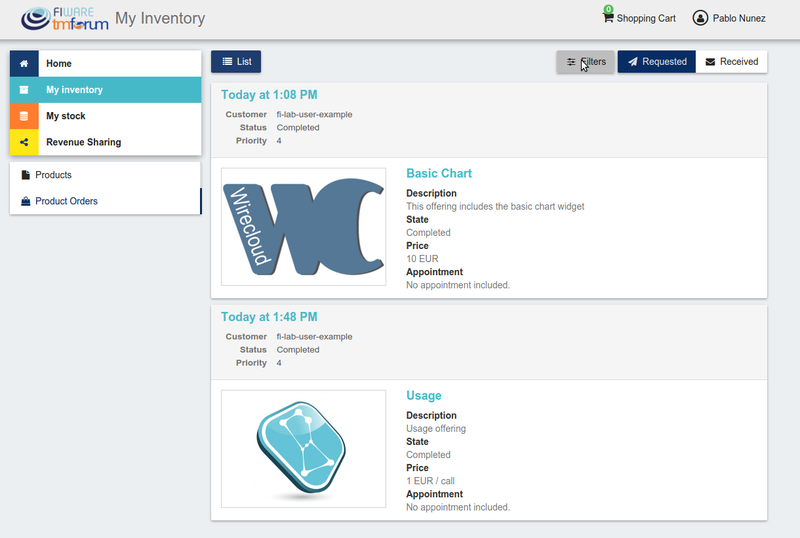 Additionally, it is possible to switch between the grid view and the tabular view using the provided buttons. 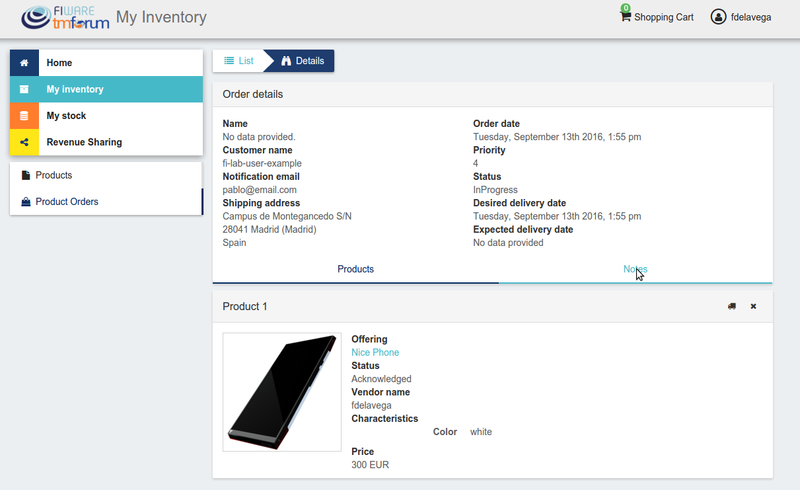 In the displayed view, provide the general information of the product spec. including its name, version, and an optional description. In addition, you have to include the product brand (Your brand), and an ID number which identifies the product in your environment. Then, click on Next. 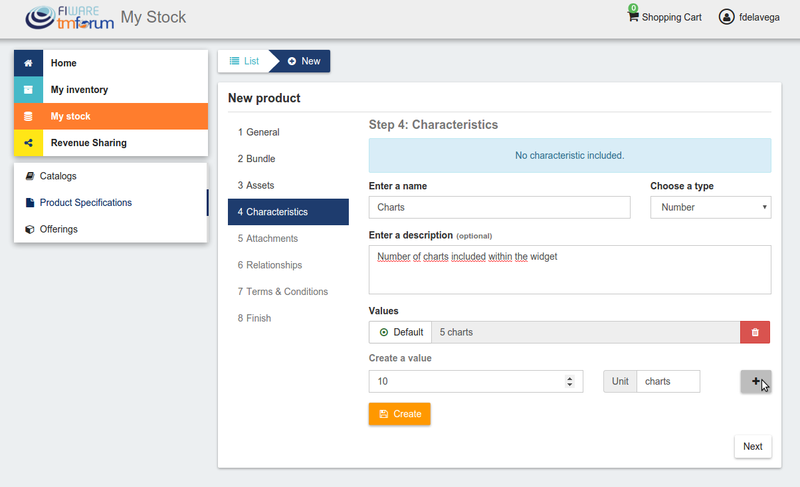 If you have decided to create a bundle, you will be required to choose 2 or more product specs to be included in the bundle. 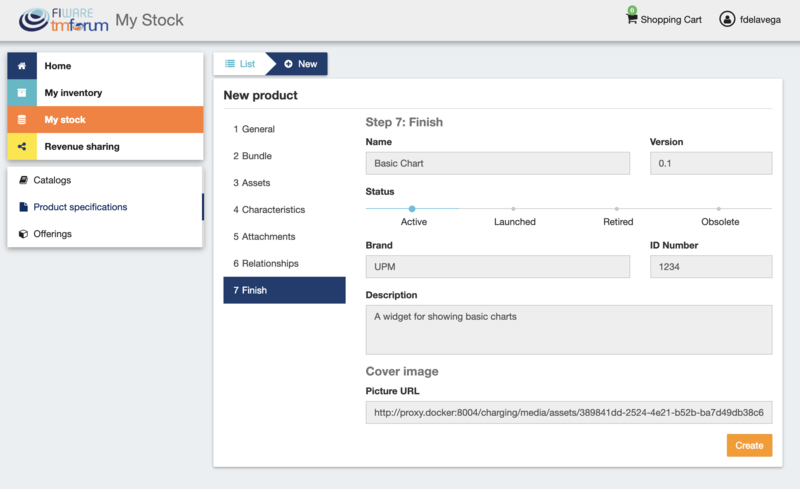 In the next step you can choose if your product is a digital product. If this is the case, you will be required to provide the asset. 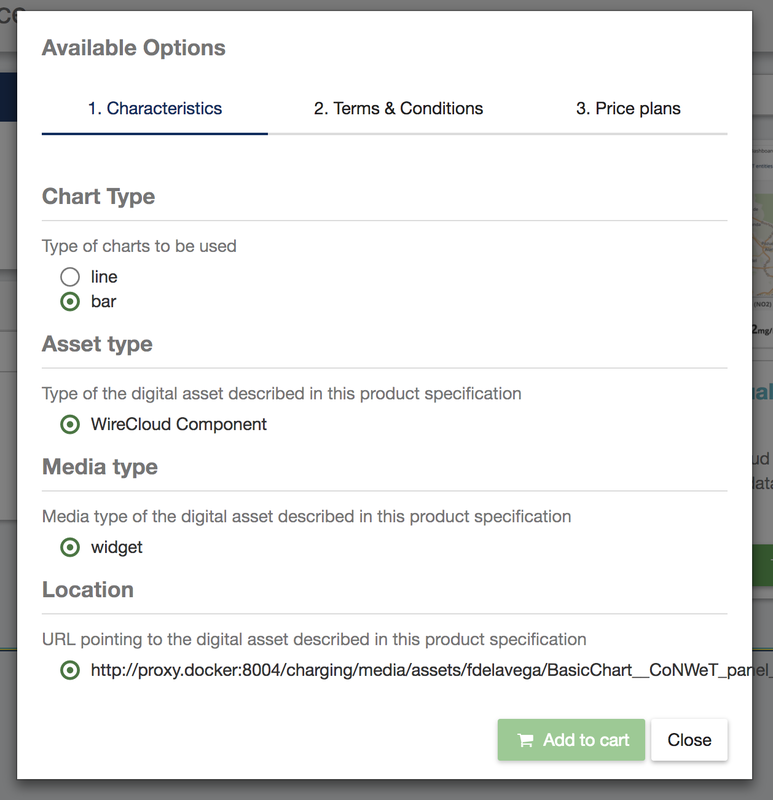 For providing the asset, you have to choose between the available asset types, choose how to provide the asset between the available options, provide the asset, and include its media type. 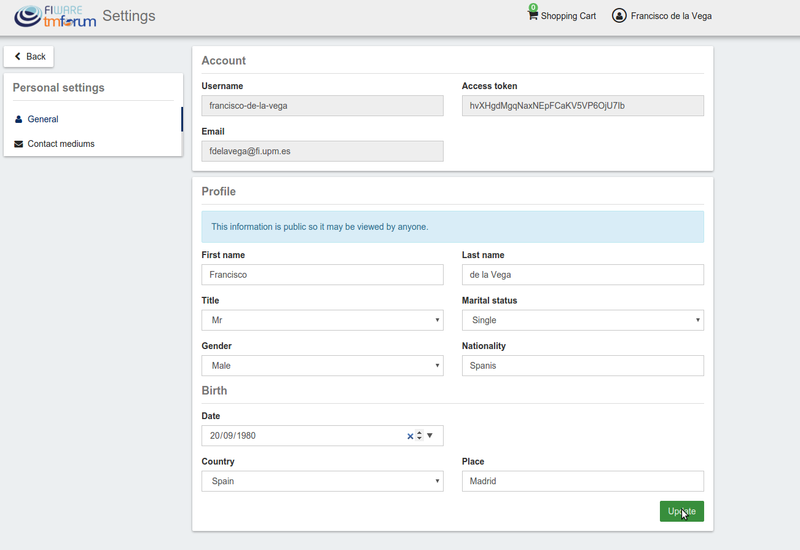 In the form, include the name, the type (string or number) and an optional description. Then create the values of the characteristic by filling the Create a value input and clicking on +. 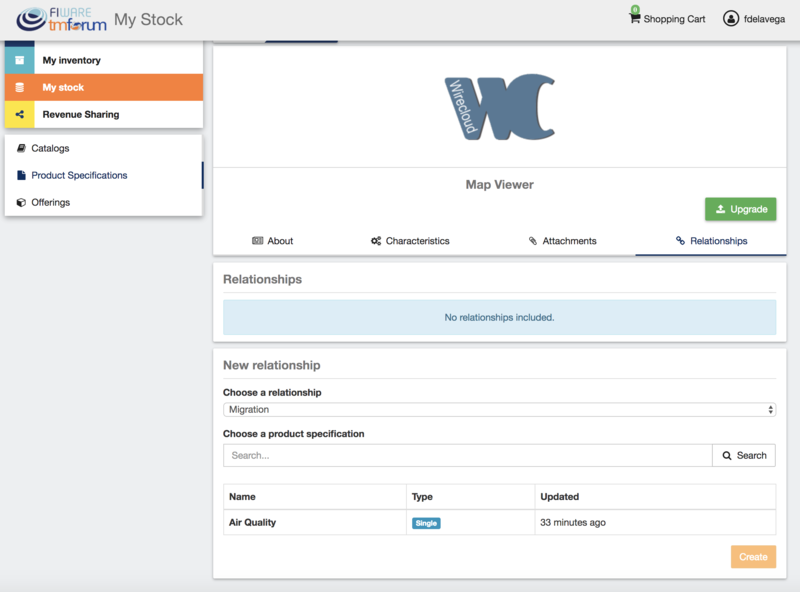 Then, you can specify relationships of the product you are creating with other of your product specs. 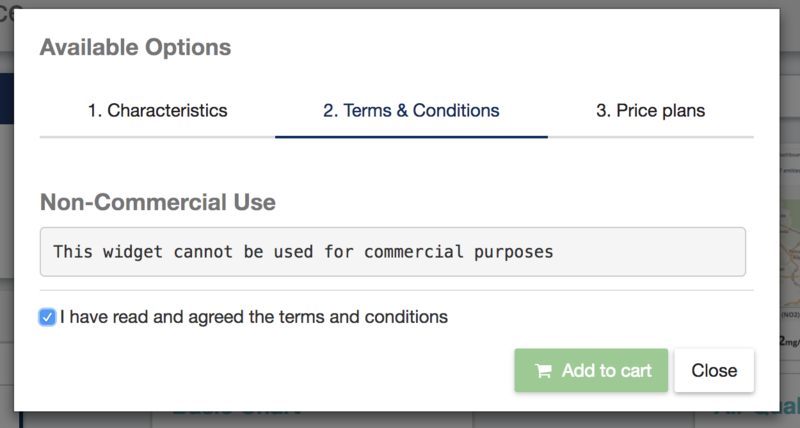 In the last step, you can specify the terms and conditions that apply to your product and that must be accepted by those customers who want to acquire it. 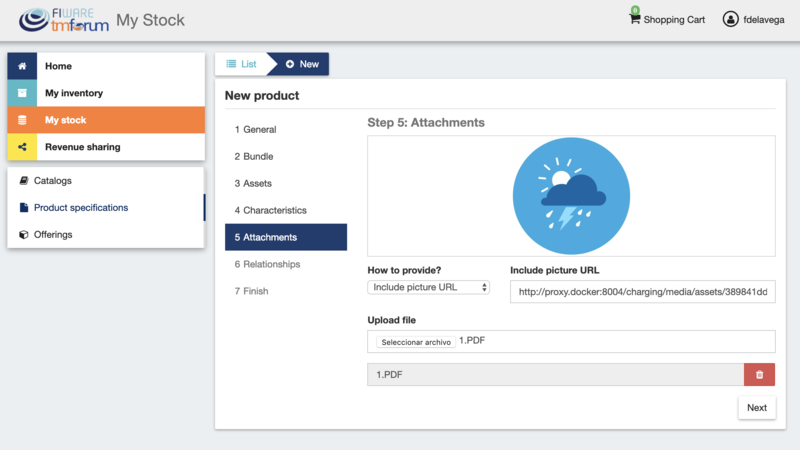 To do that, include a title and a text for your terms and click on Next. Note that the terms and conditions are not mandatory. Sellers can update their products. To do that click on the product specification to be updated. For digital products it is not allowed to update the version using this form. 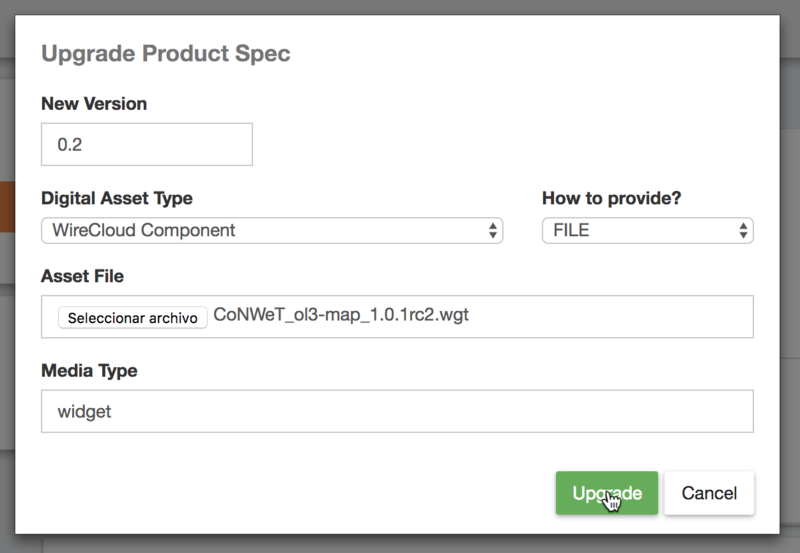 Instead it is required to follow the process for upgrading the product version. The basic information of the product specification is not the only information that can be updated, but it is also possible to update the Attachments and the Relationships by clicking of the related tab. 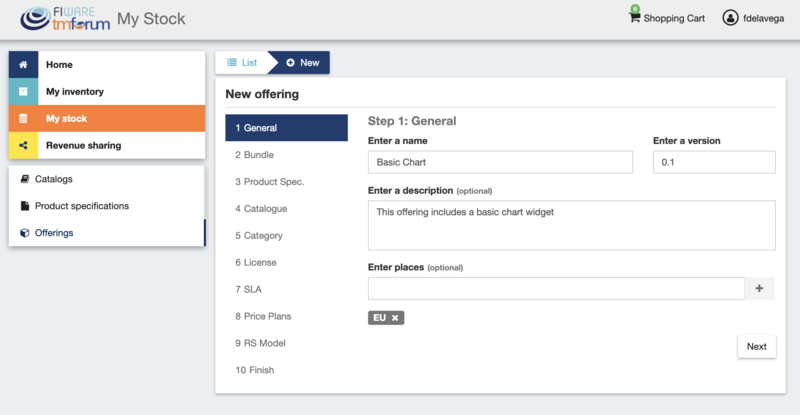 The displayed details form can be used for digital products specifications in order to provide new versions of the digital assets being offered. This can be done by clicking on Upgrade. 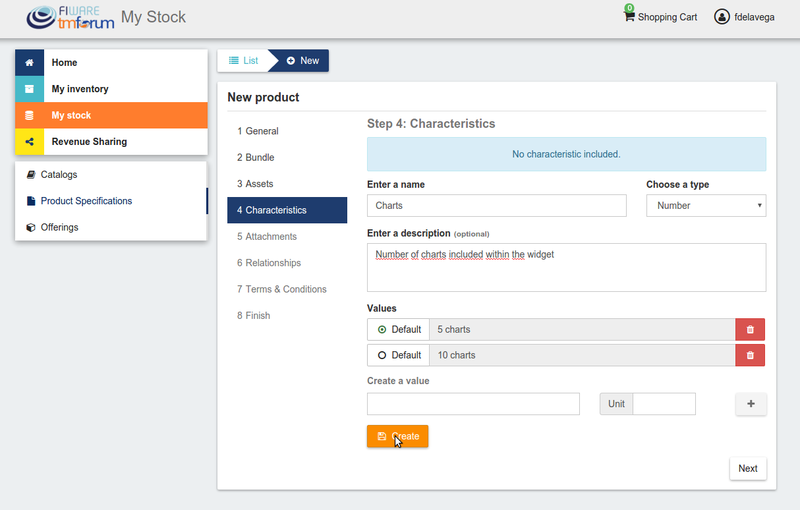 In the displayed form, it is required to include a new version for the product specification and to provide the new digital asset to be offered. All the customers who have acquired an offering including the current product specification will be able to access to the new version of the digital asset. 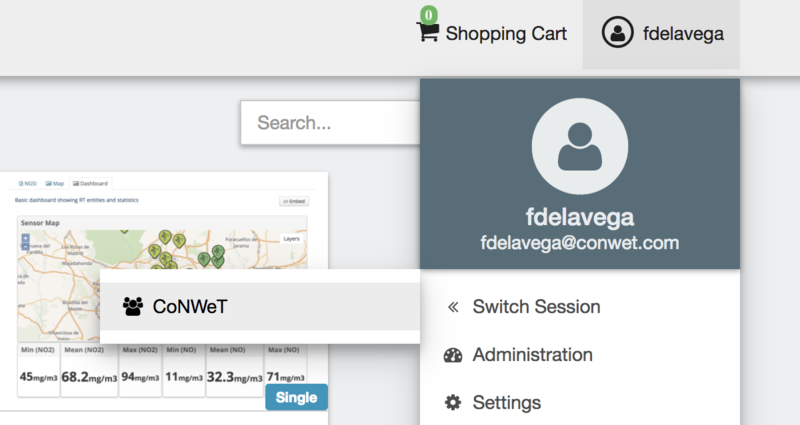 Additionally, it is possible to switch between the grid view and the tabular view by clicking on the specific button. 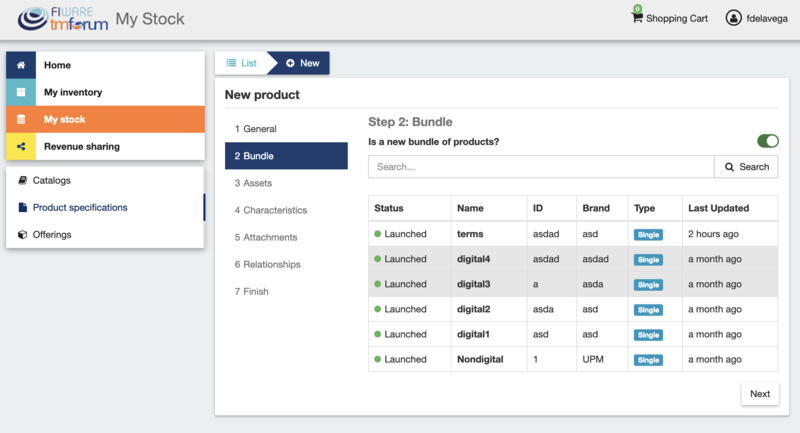 If you want to create a bundle you will be required to include at least two bundled offerings. 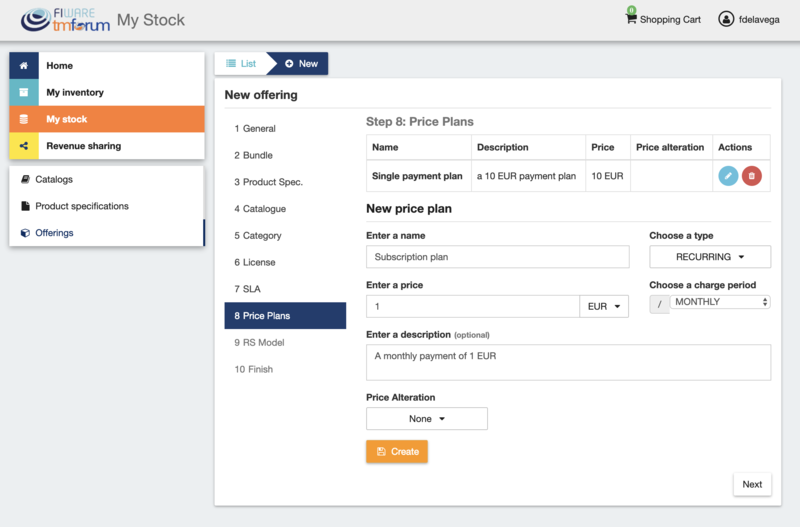 In the next step you have to select the product specification that is going to be monetized in the current offering. Once selected click on Next. The next step is the more important for the offering. 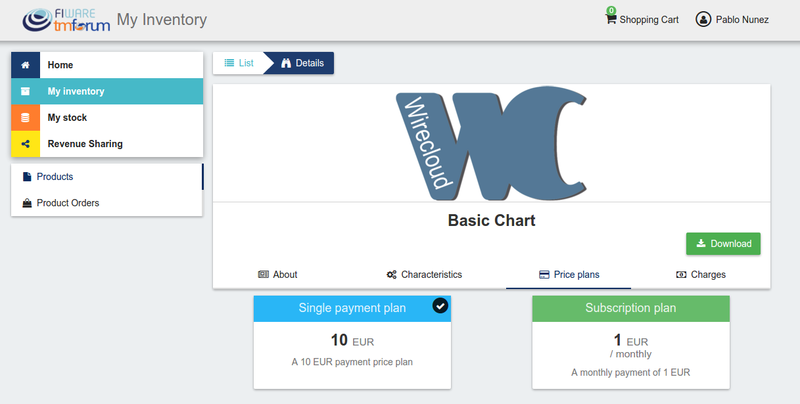 In the displayed form you can create different price plans for you offering, which will be selectable by customers when acquiring the offering. If you do not include any price plan the offering in considered free. 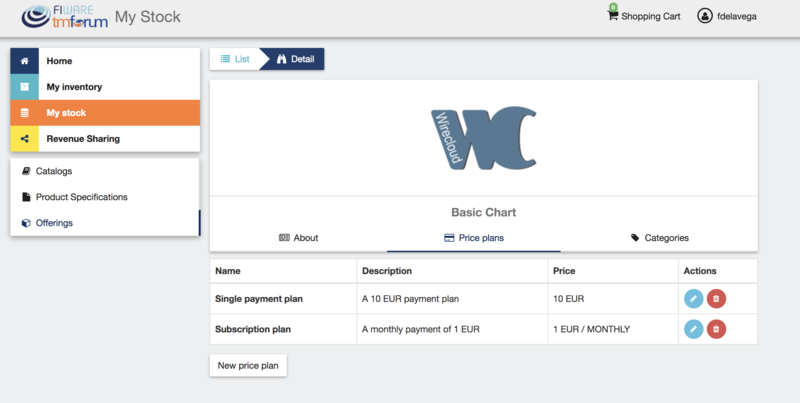 For creating the price plan, you have to provide a name, and an optional description. 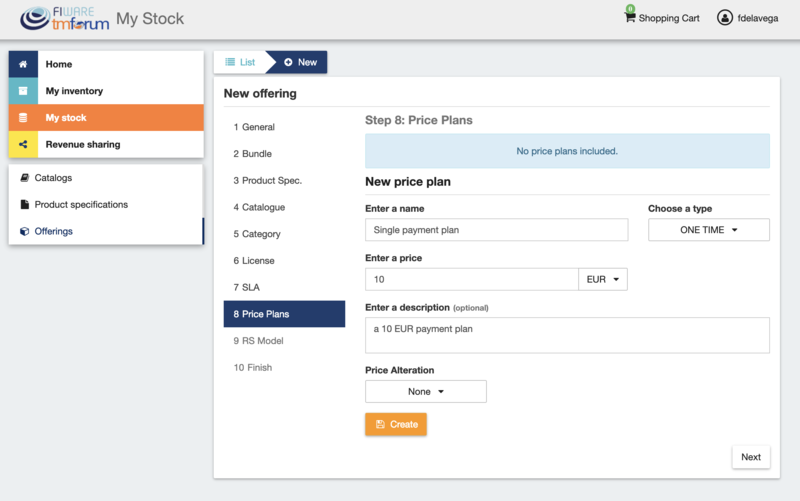 Then, you have to choose the type of price plan between the provided options. 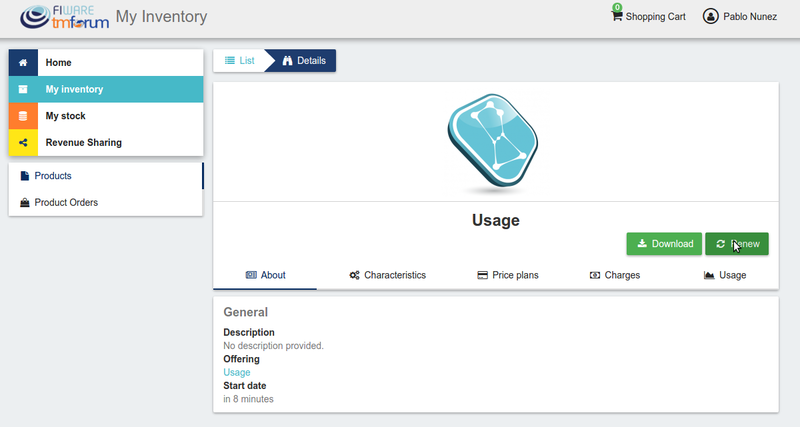 The available types are: one time for payments that are made once when purchasing the offering, recurring for charges that are made periodically (e.g a monthly payment), and usage for charges that are calculated applying the pricing model to the actual usage made of the acquired service. If you choose one time, you have to provide the price and the currency. 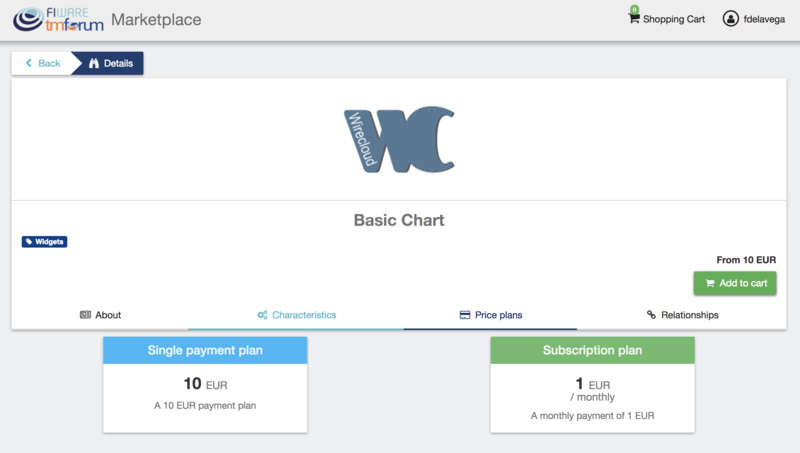 If you choose recurring, you have to provide the price, the currency, and the period between charges. You can update or remove plans by clicking on the corresponding action button. In the last step of the process, you have to choose the revenue sharing model to be applied to you offering between the available ones. Once done, click on Next and then on Create. Sellers can also edit their offerings. To do that click on the offering to be updated. It is also possible to update the Price Plans and Categories of the offering by accessing to the related tab. 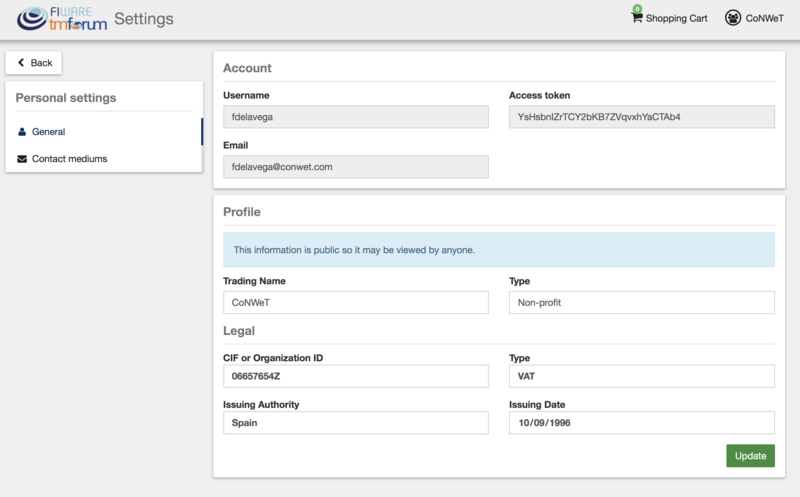 Revenue Sharing Models specify how the revenues generated by an offering or set of offerings must be distributed between the owner of the Business API Ecosystem instance, the provider of the offering, and the related stakeholders involved. To manage RS models go to the Revenue Sharing section. 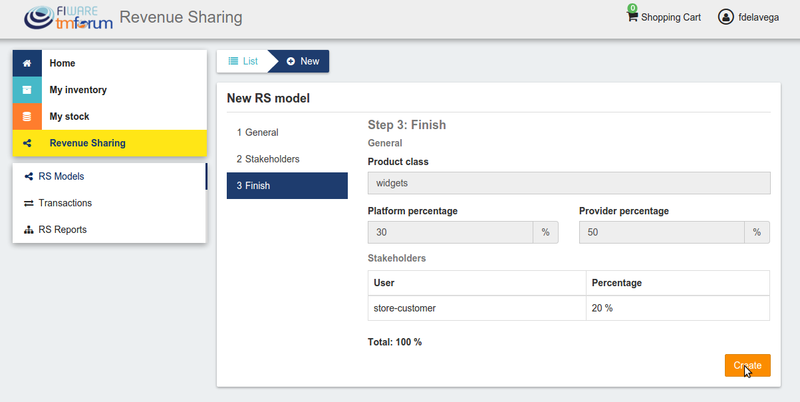 In this view, you can see the revenue sharing models you have available. By default it will appear the default RS model which establishes the revenue distribution between you and the Business API Ecosystem instance owner. Sellers can also update their RS model. To do that click on the RS model to be updated. These transactions are aggregated and paid by the Business API Ecosystem periodically once a month. Nevertheless, if you need to be paid, you can force the revenue sharing calculus and payment of your pending transactions by manually generating a revenue sharing report. 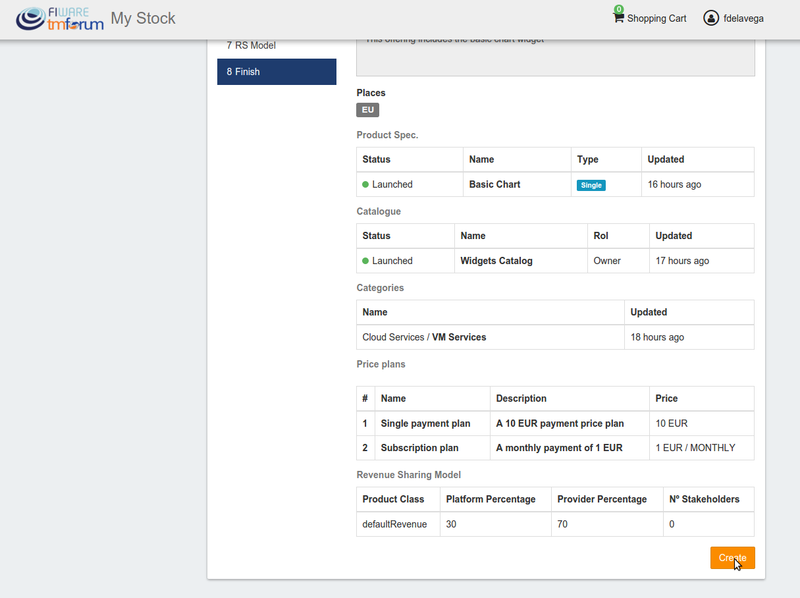 This process will aggregate all the transactions with the selected product classes, calculate the amount to be paid to each stakeholder using the related revenue sharing model, generate a revenue sharing report, and pay the seller and the stakeholders using their PayPal account. 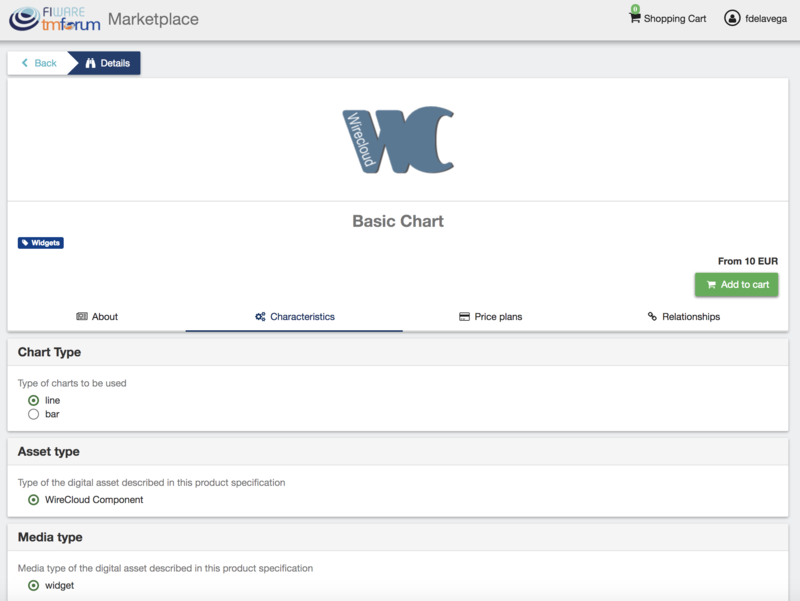 Sellers can manage the orders they have received in order to see the chosen characteristics, read customer notes, or process the order in case it has been acquired a physical product. To view your received orders go to My inventory section, click on Product orders, and open the Received section. 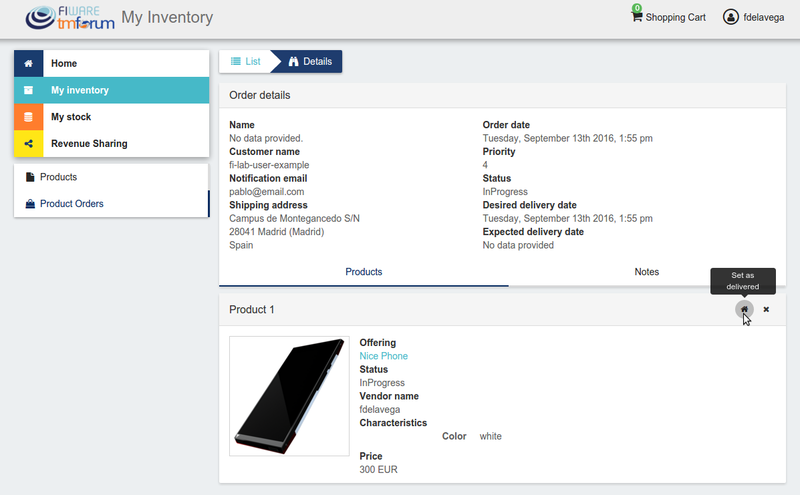 In the displayed view you can review the details of the order and the details of your products acquired by the customer, including the chosen characteristics. If the acquired product is not digital, the order needs to be processed manually by the seller, in the sense that the seller will have to send the acquired product to the customer. 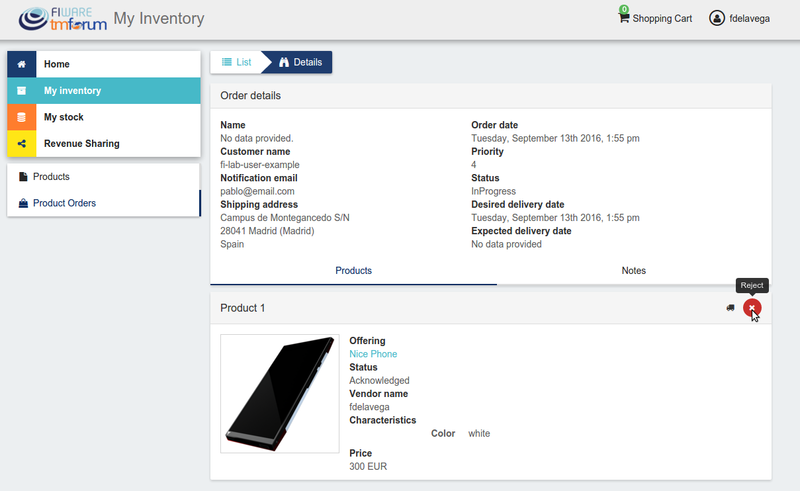 To deal with this situation, the order details view allows sellers to manually change the status of the order. 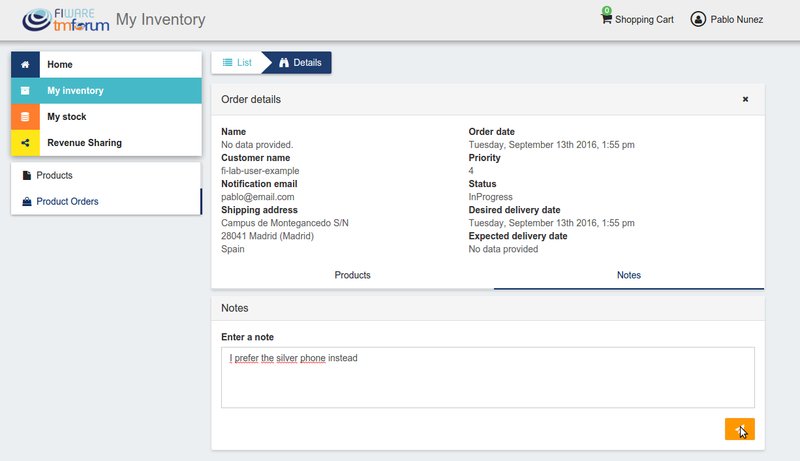 To reject a received order you have to click in the Reject button located in the search or in the details view of the order. All of the users of the system have by default the Customer role. Customers are able to create orders for acquiring offerings. 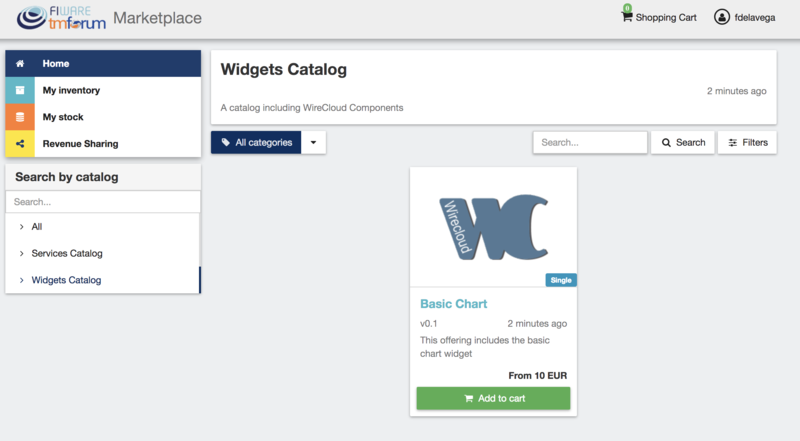 All the available (Launched) offerings appear in the Home page of the Business API Ecosystem, so they can be seen by customers. 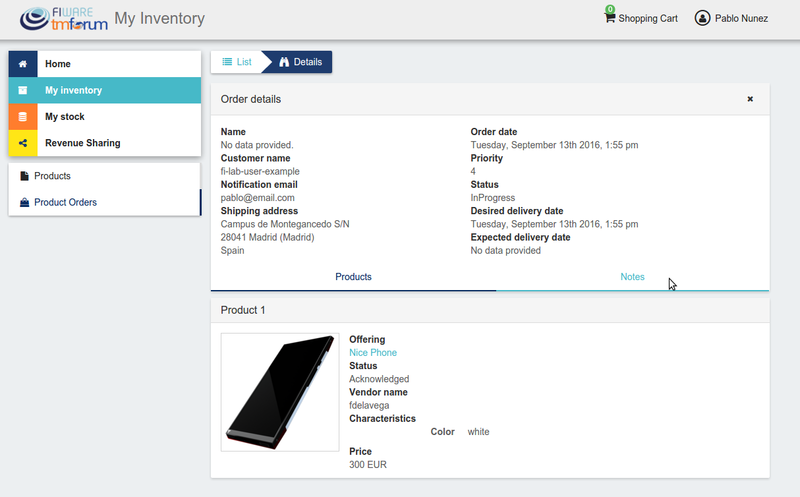 Additionally, customers can select a specific catalog of offerings by clicking on it. 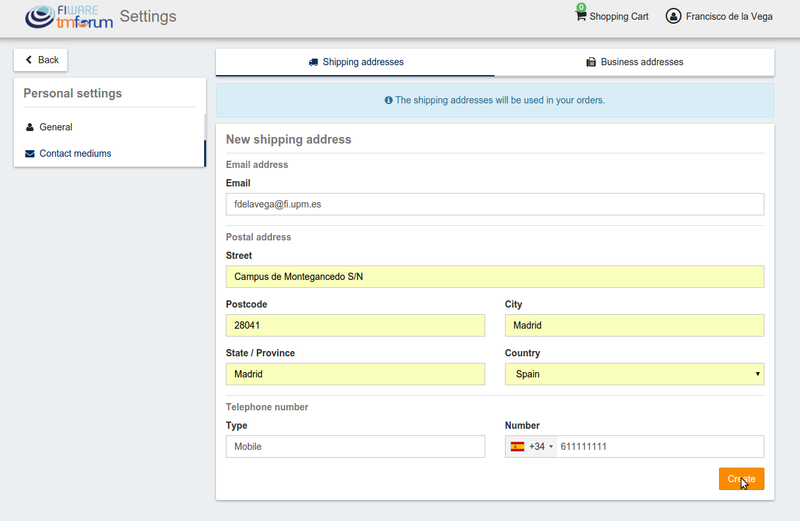 Moreover, customers can filter the shown offerings by category using the categories dropdown and choosing the wanted one. 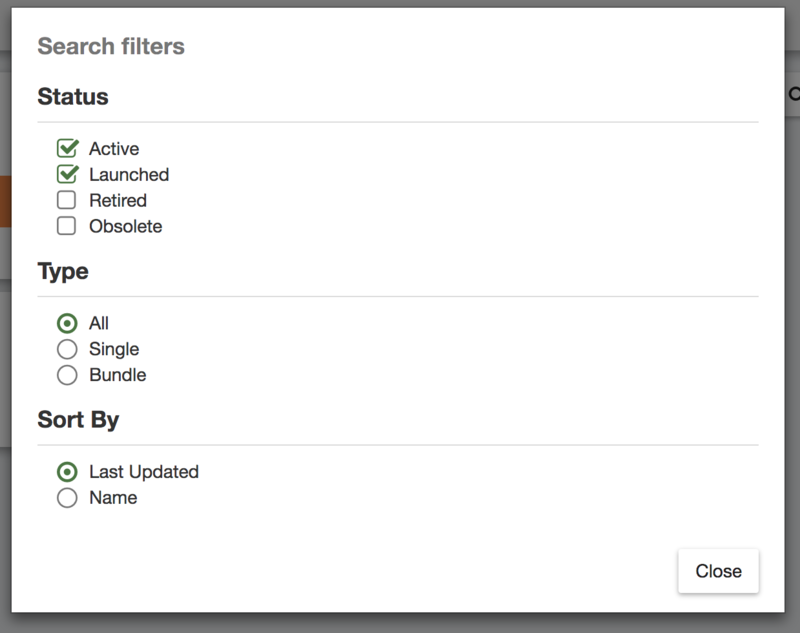 Customers can also filter bundle or single offerings using the Filters modal as well as choosing its sorting. 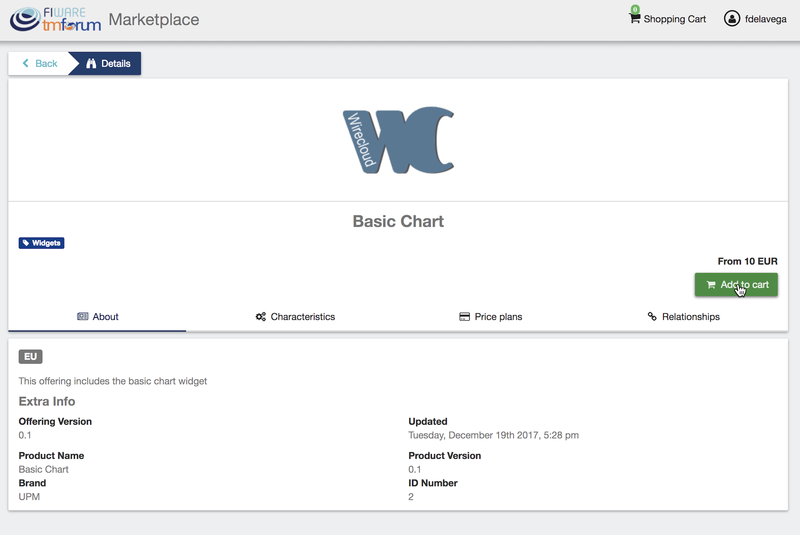 In the displayed view, it is shown the general info about the offering and its included product, the characteristics of the product, the price plans of the offering, and the existing relationships. 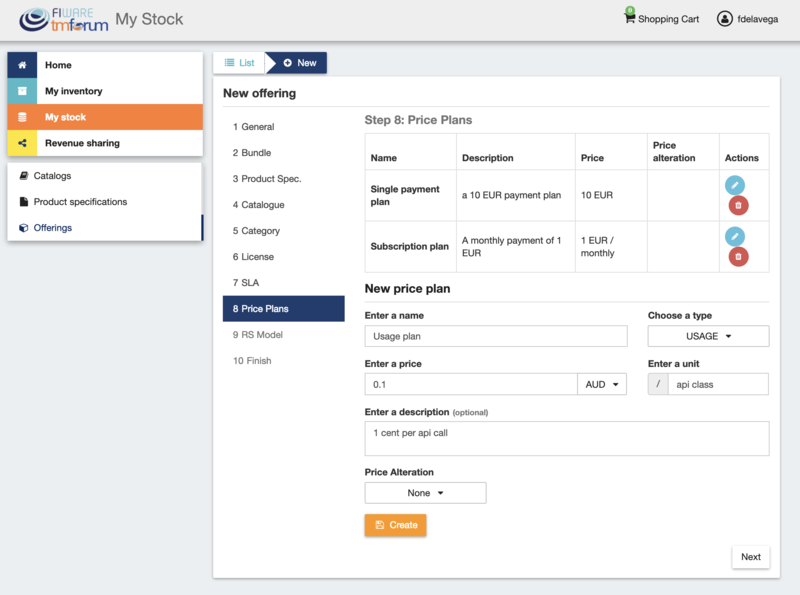 Customers can create orders for acquiring offerings. 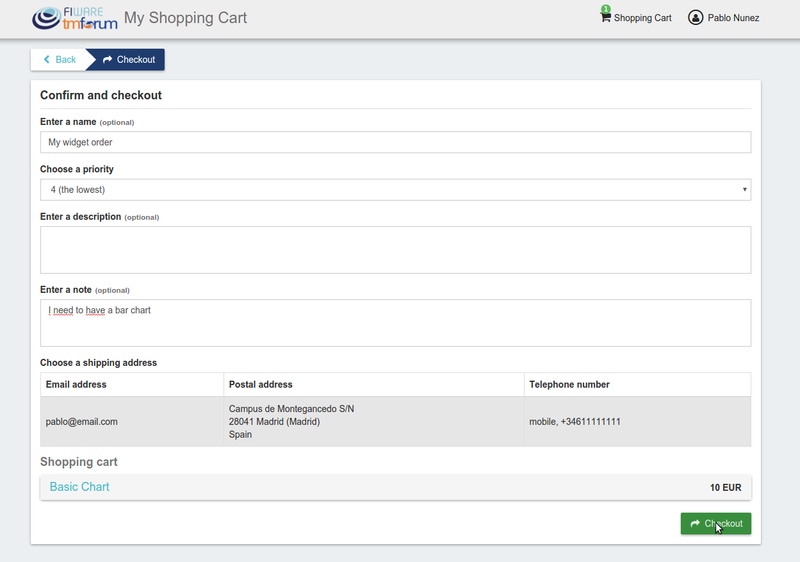 The different offerings to be included in an order are managed using the Shopping Cart. To include an offering in the shopping cart there are two possibilities. 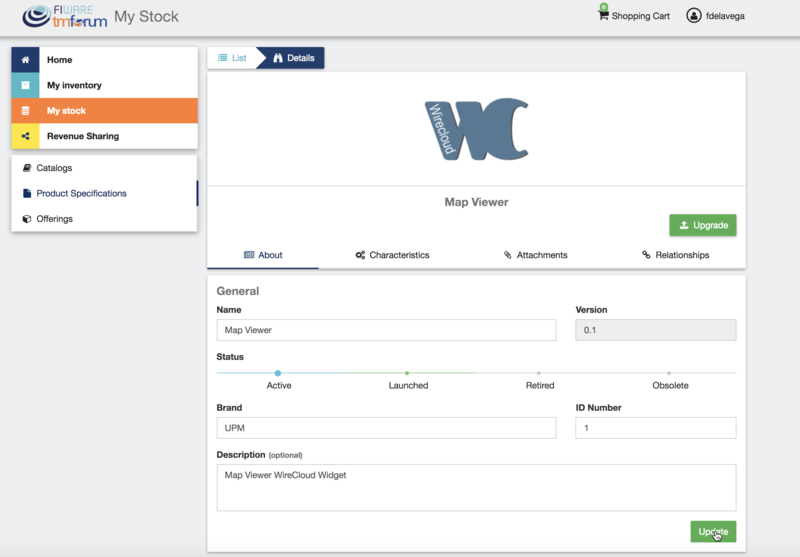 You can click on the Add to Cart button located in the offering panel when searching, or you can click on the Add to Cart button located in the offering details view. 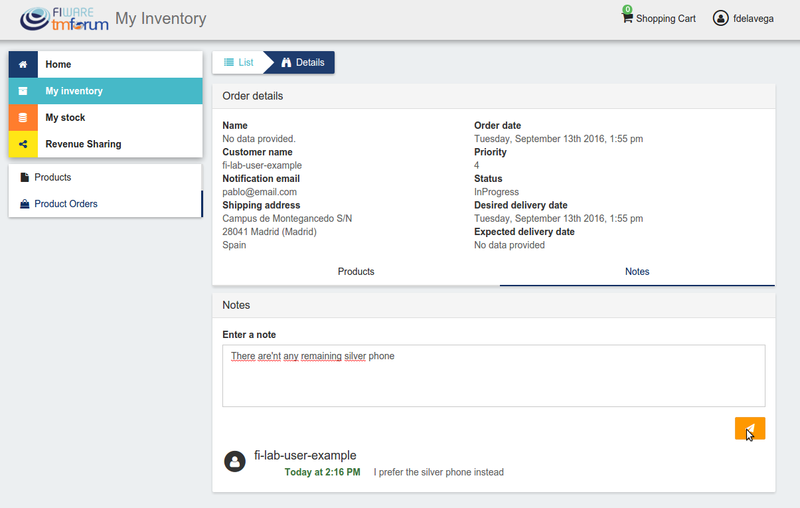 In the displayed form, you can include an optional name, an optional description, or an optional note. Notes can include any additional information you want to provide to the sellers of the acquired offerings. 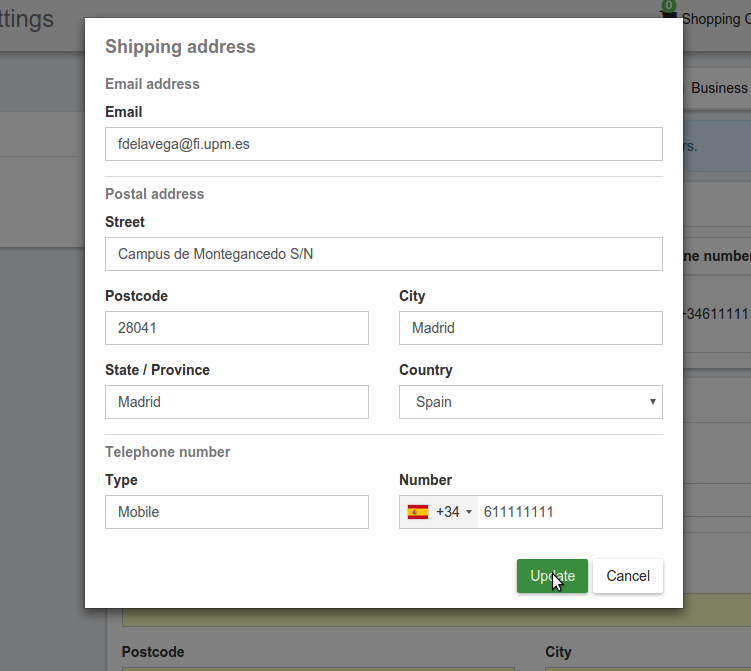 Then, you have to choose a priority for your order, and select one of your shipping addresses. 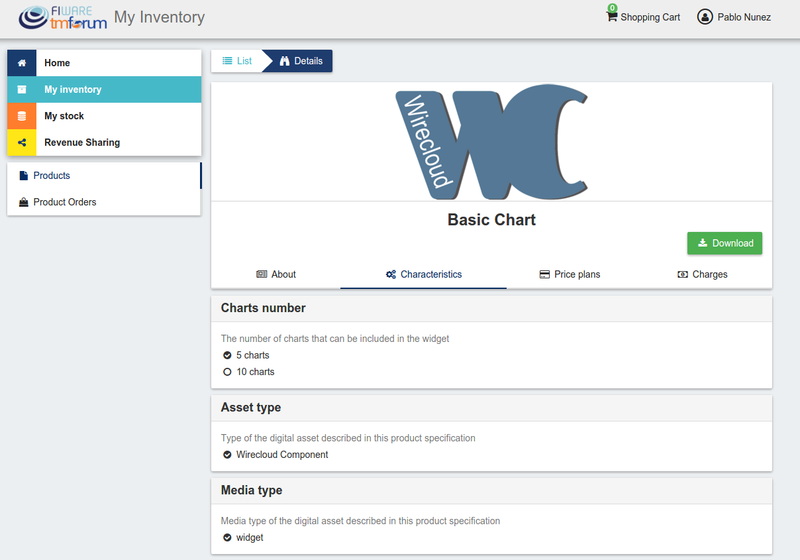 The products you have acquired are located in My Inventory, there you can list them, check their status, or download different assets. 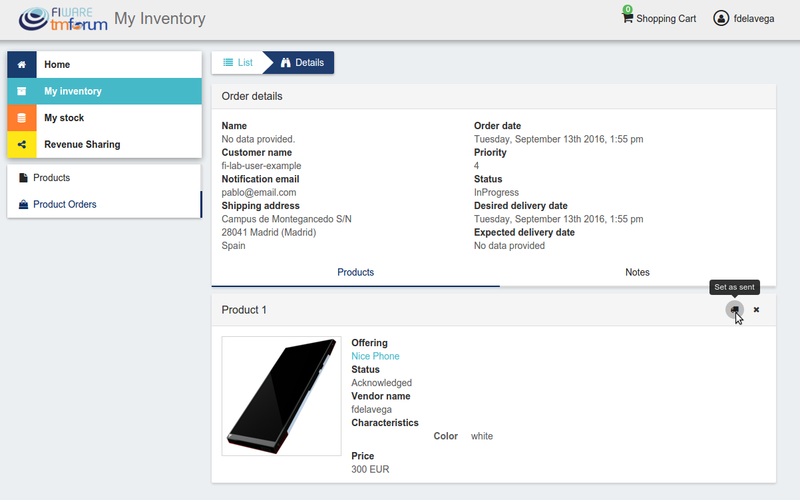 In the displayed view, you can see the general info of the acquired product, and the characteristics and pricing you have selected. 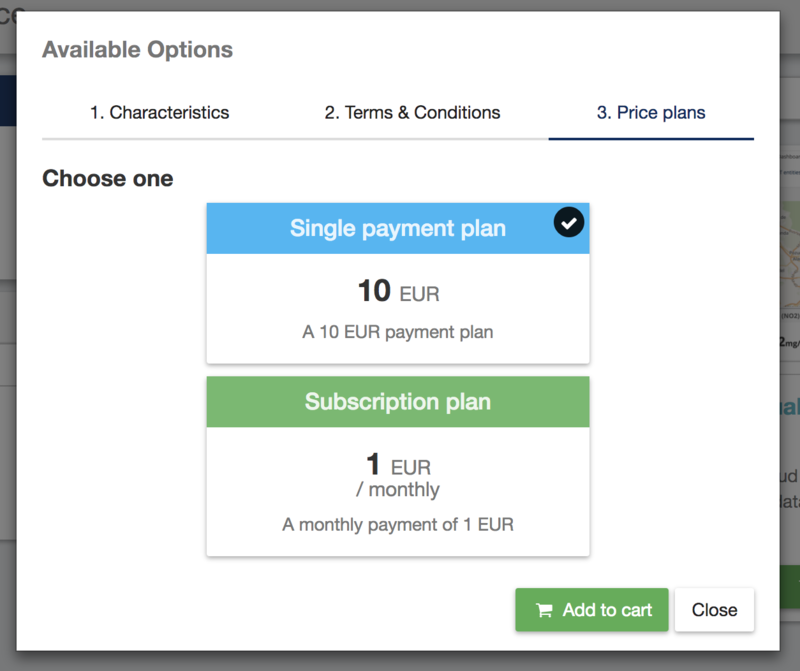 In case the chosen pricing model defines a recurring payment or a usage payment, you will be able to renew your product clicking on Renew. 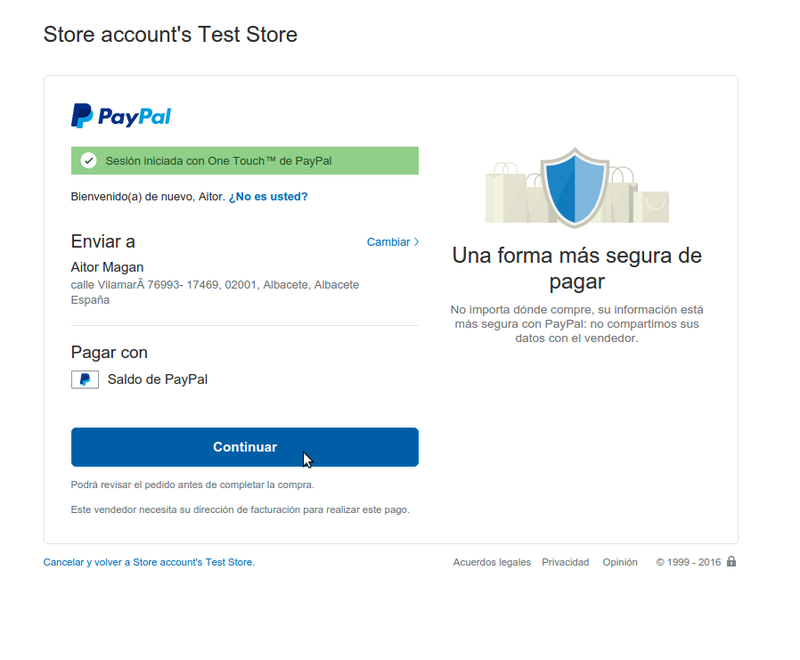 After clicking, you will be redirected to PayPal to pay the related amount. Moreover, you can review the details of the order. To do that click on the date of the order. © Copyright 2016 Revision c328b6e5.